I’ve always been fascinated by the history of lenses. I write about it a lot. To me, the most fascinating items are those made many years ago, with what we would consider wholly inadequate technology, which did things we can hardly reproduce today. Not long ago, I learned of a lens I’d somehow missed, the Minolta MC Rokkor X 40-80mm f/2.8 zoom(1, 2, 3). 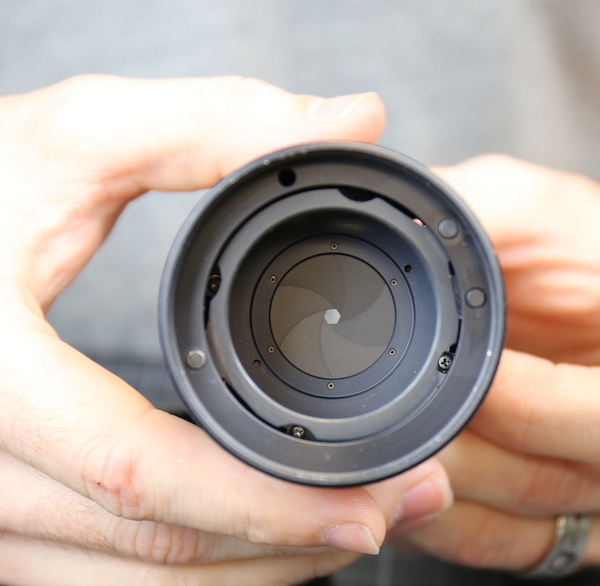 Let’s pay a little respect to the innovation of this lens. 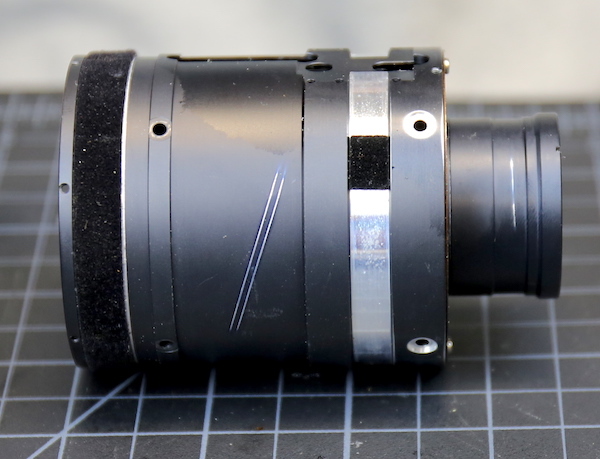 It’s an f2.8 zoom, but has an only 55mm front element diameter, is about 10cm (4 inches) long, and weighs 560 grams (just over a pound) despite being all-metal construction. From many reports and examples, it has excellent image quality. 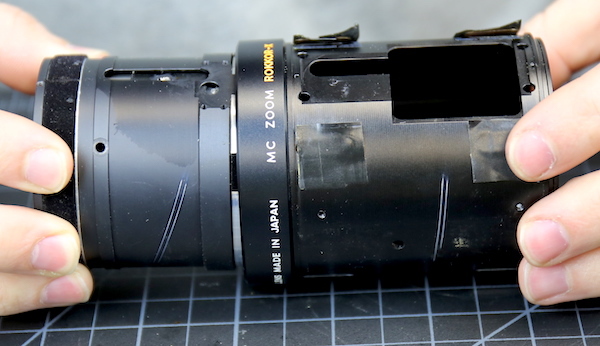 It is also completely unique (as far as I know) in being the only zoom lens driven by an external gearbox. There have been a few telescoping zooms. 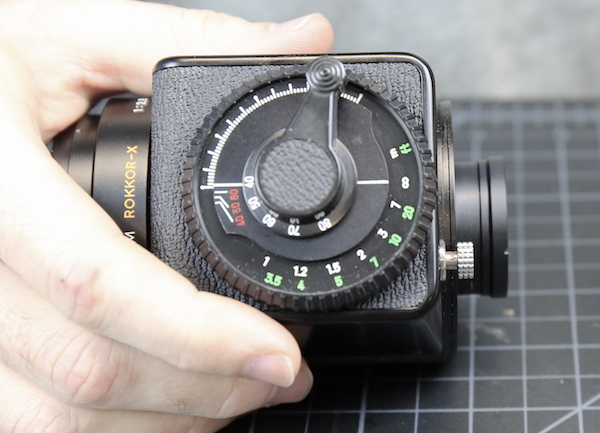 The first zoom, the Voigtlander Zoomar, used a sliding ring set on thick rods. 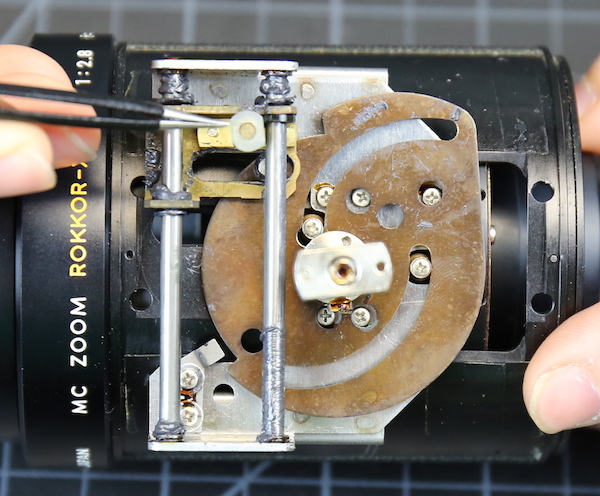 Almost all other zooms have used a rotating helicoid to move the zoom groups. 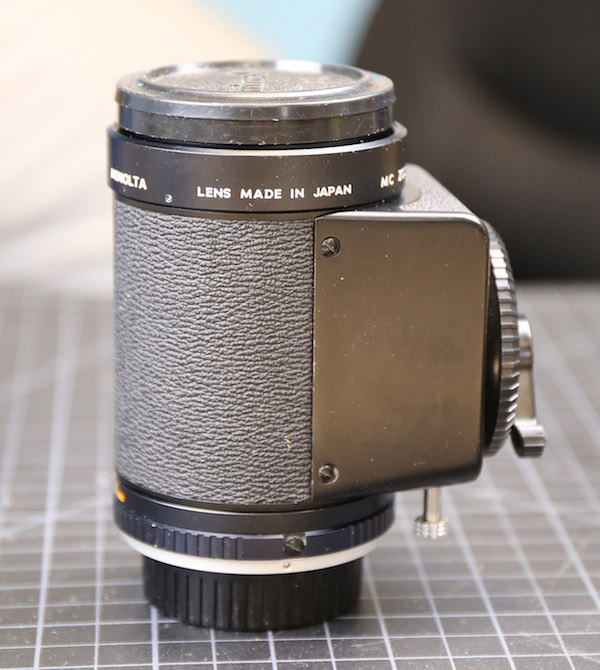 But only the Minolta put a mechanical box on the side of the lens to drive the focusing and zoom elements. 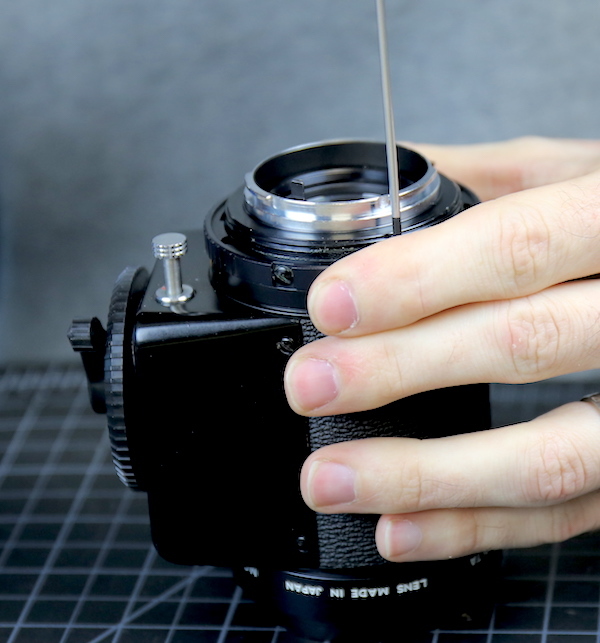 Moving the lever with your thumb to zoom the lens, spinning the wheel with your fingers focuses it, and moving the metal thumbscrew at the bottom in and out, puts the lens in macro mode. 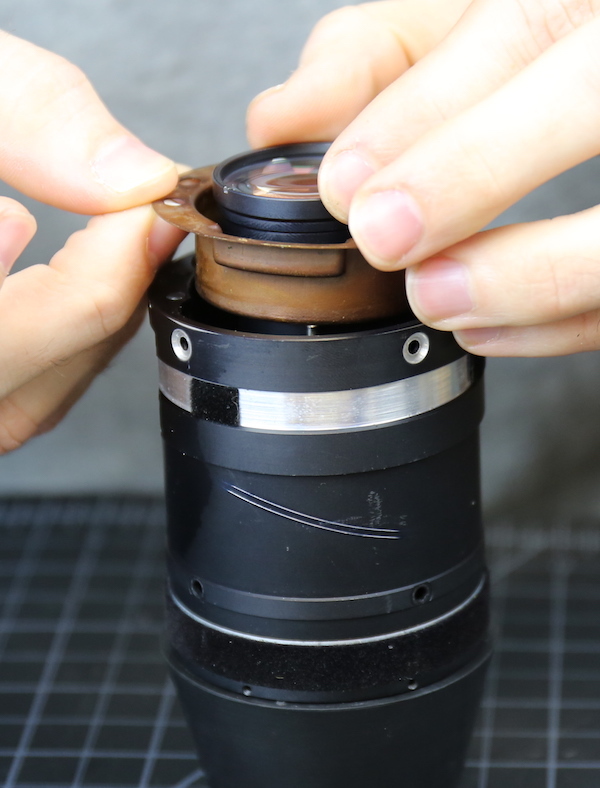 So when I got my hands on a copy of this unique lens, I had two questions. First, was it as good as they say it was? Second, how the hell does that gearbox thing work? Luckily, we had the capabilities to answer both questions. 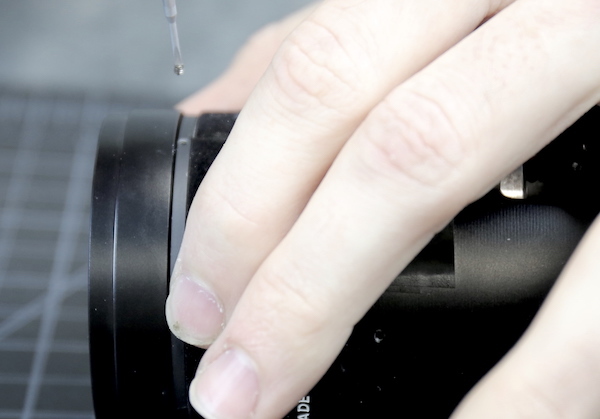 We didn’t have exactly the right lens mount for this lens but were able to make something work. At 40mm, though, the very edges of the test circle were cut off, but still, at 40mm and f/2.8 this is a pretty impressive performance for a 40-year-old zoom lens. At 80mm things were less impressive. 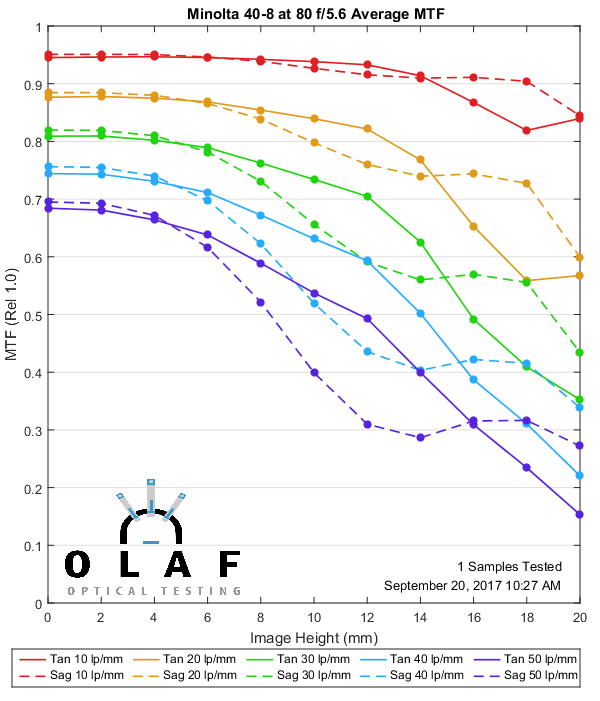 This is a 40-year old lens, and things could have happened to it that affected performance, but further tests showed no decentering or field tilt. Still, it’s possible there’s a spacing error at the long end of the zoom range. My summary is it looks just like a good film zoom from the 70s would be expected to look. It’s pretty good at the wide end, needs to be stopped down at the longer end, but overall is a very usable lens. To get that in such a small package with macro capabilities, well, that’s impressive. Be patient, though. We’ve never seen a lens even slightly like this, so we have absolutely no idea what we’re doing today. Most days we have at least a vague idea. We had two hints, though. First, the lens is covered in a nice leatherette, like a camera body of the times. Leatherette is usually there to cover screws. Second, we could see some set screws around the barrel. You don’t see set screws in lenses today very often, but when you do, well, they need to come out. We removed the 3 set screws around the rear barrel. With the set screws out, a rear ring, we’ll call it a makeup ring, came off. With that out of the way, we could see some real screws underneath. Taking them out seemed a logical next step. 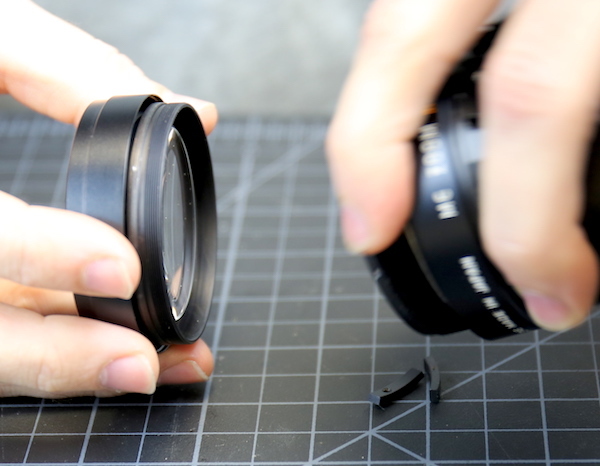 After removing those, Aaron could slide off the aperture control ring. We were starting to feel a little confident now. That confidence, as you will see, was entirely misplaced. 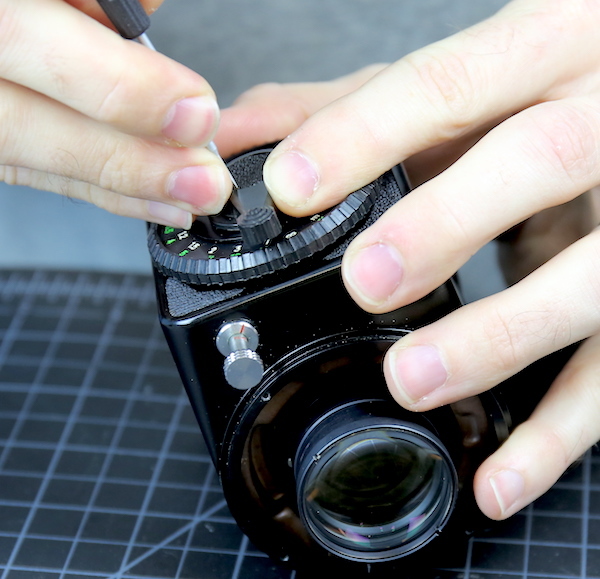 The aperture control assembly is pretty routine. 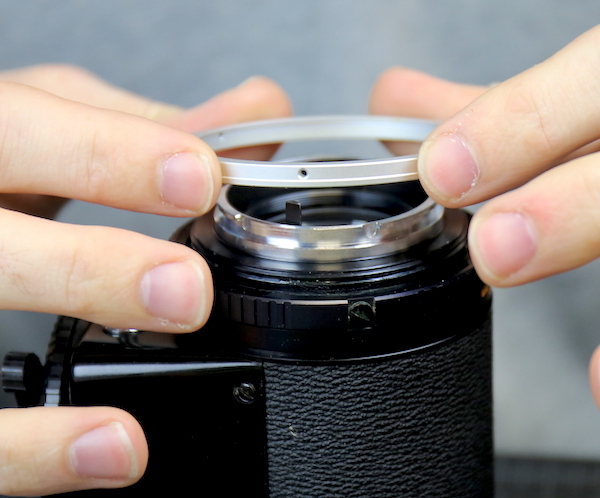 There’s a relatively long slotted key that inserts into the aperture ring. 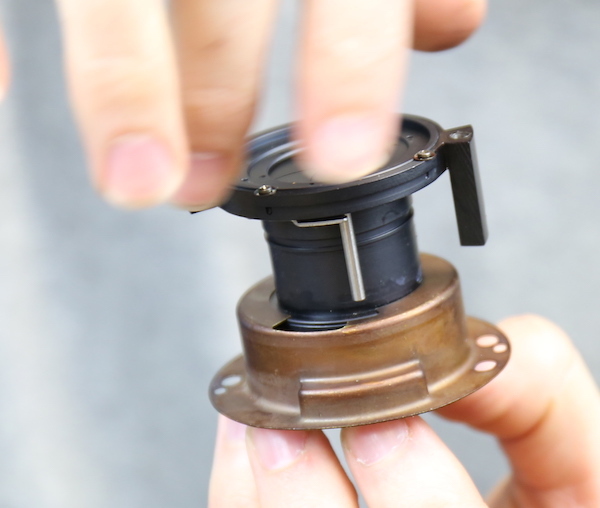 You can see a spring underneath it and a counter spring on the other side. 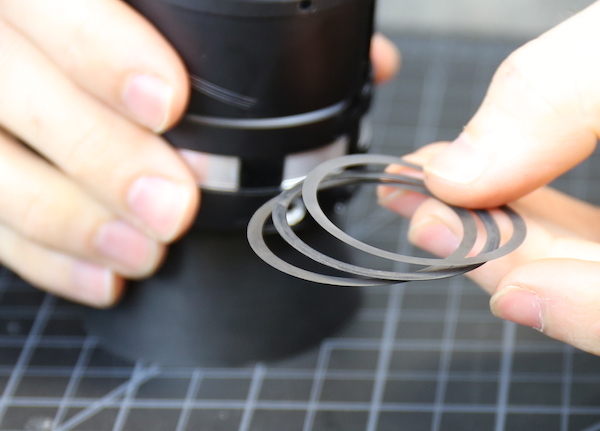 You may have noticed the thick, brass spacing shim under the aperture ring. It’s in a location where it could be an adjustment for infinity focus, but we aren’t certain given its thickness. It might just be a standard, non-variable spacer. 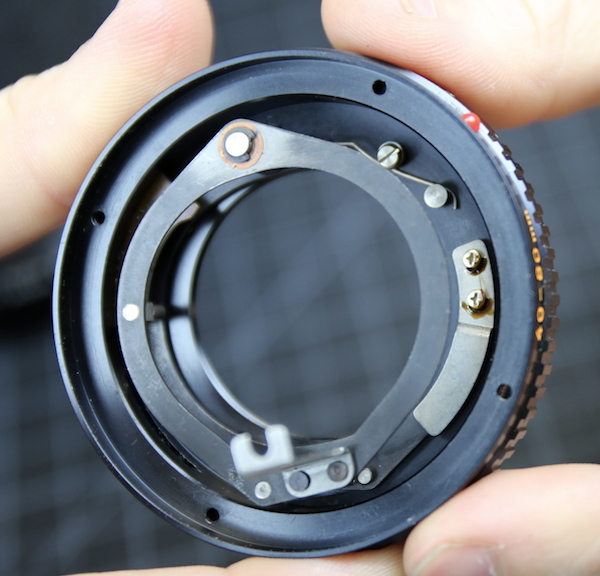 With the aperture control assembly off, there was a rear group sticking out that looked like it could be removed. There was also a rear metal plate that looked like it was made of tarnished copper. There were a couple of screws in the plate that looked as though they wanted to be removed. You may also notice the three black plugs in the plate. We weren’t sure what they were, but assuming the moving elements slid along some type of rail, we thought that could be the rail ends. 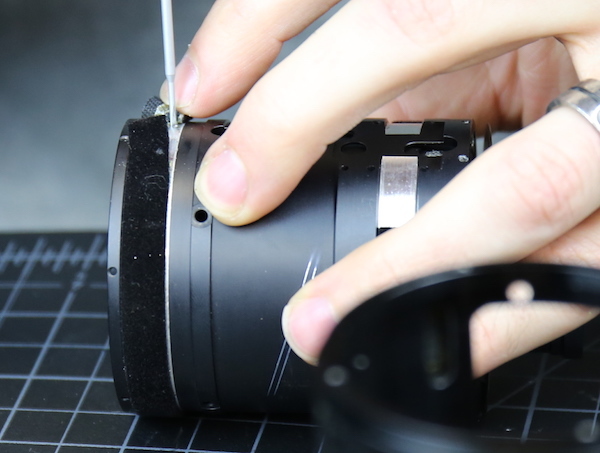 While we decided which way to go next, we played around with the gearbox a bit, because with the rear of the lens barrel off you can get a nice, clear look at what the silver thumbscrew lever does. 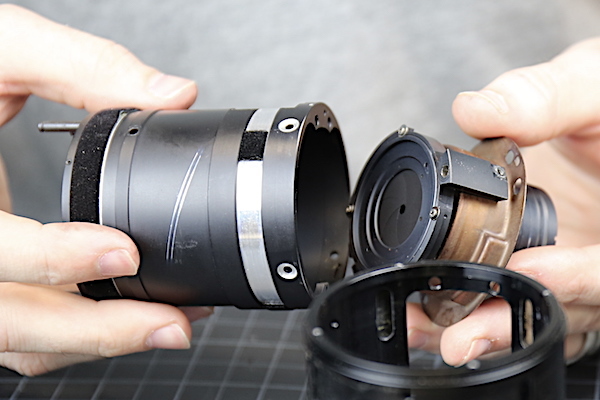 Turning it and pushing it in moves the lens’ optical assembly forward, basically like putting a built-in extension tube on the lens. This was done by Minolta in 1975. 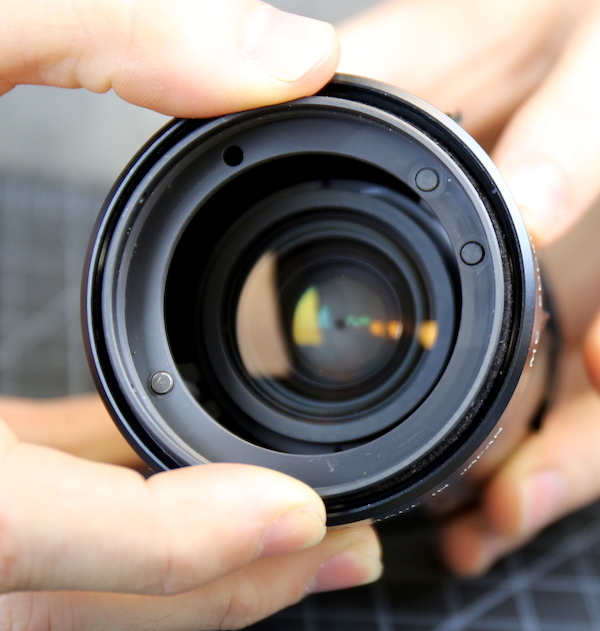 It was done again in 2013 when Canon released the 24-70mm f/4 IS Macro. (Mock me if you must, but the 24-70 f/4 IS is the lens I use most.) Minolta, in the 1970s and 80s, was arguably the most innovative camera company, with Nikon and Canon often playing catch-up. 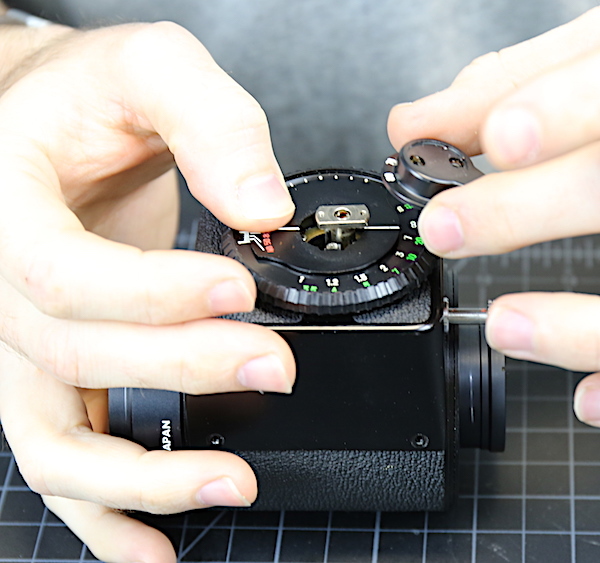 Anyway, after playing around with the Macro button and turning the focus knob and zoom lever some more, we decided ‘neither of the above’ was the best option and started taking out the screws from the mechanical box cover. This is different for us because unlike today’s lenses, the screws were slotted, not JIS. We had to hunt around for a bit to find the right screwdriver. Removing the screws loosened the box, but it wasn’t going anywhere because the zoom lever and focusing wheel were still fixed in place. The bit of leatherette on top of the focusing wheel seemed unlikely to just be decorative. So we peeled it off. And sure enough, there were some nice big screws under there. The focus lever lifted right off once those were removed. After that, we could lift the mechanical housing off. Notice that the center post, which controls zoom, is still part of the lens. The focus ring and macro thumbscrew mechanisms are part of the housing we took off. Well, How Do I Work This? If you don’t like fascinating mechanics, you can skip this part. But we will all think less of you if you do. Let’s start with the case we just removed, which contains the macro and focusing mechanisms, both of which move what, for lack of a better term; I will call the Magic Slot (red arrow) in the top case. As an aside, I would very much like to buy whoever designed this a beer. This, my friends, is a mechanical art of the highest order. I’m going to compress the images a bit to show you how things work. 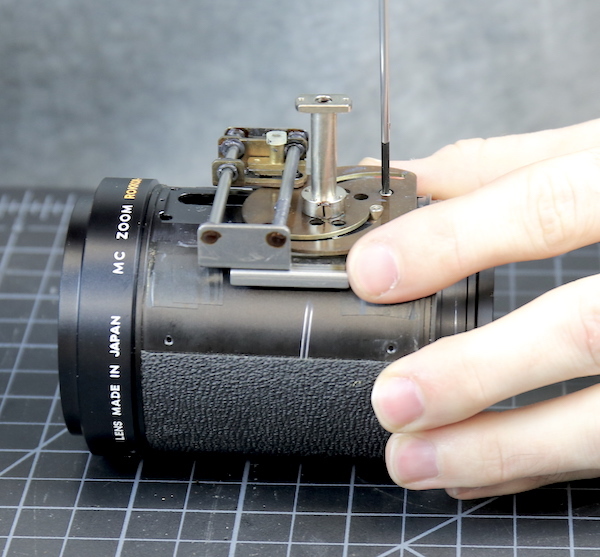 First, when we move the lens from standard (thumbscrew out) to the macro (thumbscrew in) position, we move the top side (in the picture) of the lever forward. 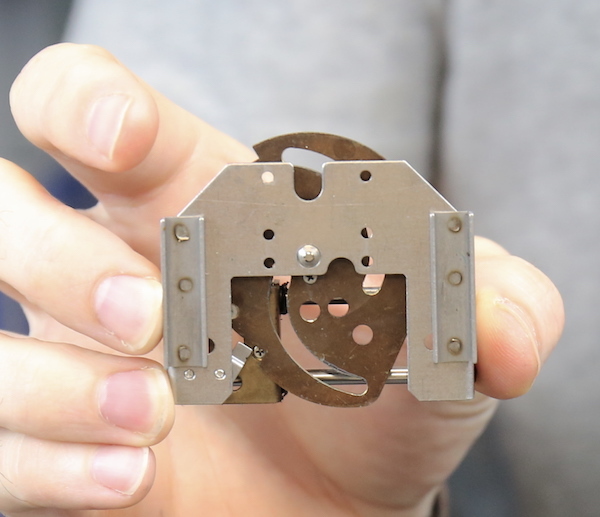 If we rotate the focusing wheel, we move the lower side of the lever forward or backward. Closest focus is the image on the left below, infinity focus on the right. 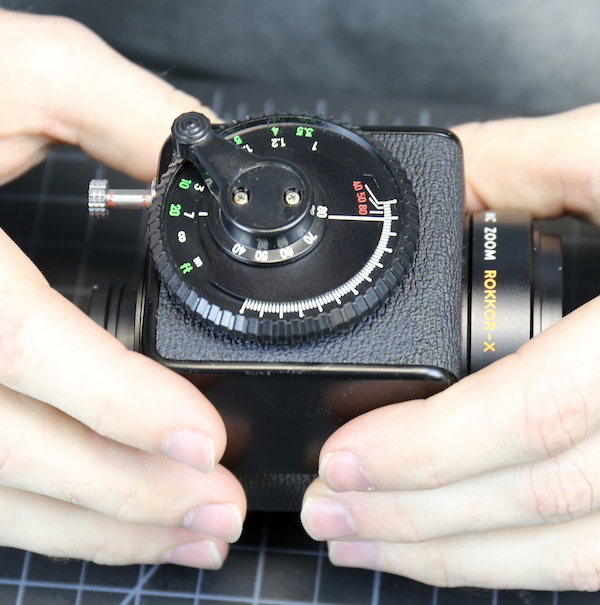 If you think that’s a little confusing, maybe showing you what the Magic Slot does to the lens will help. Or maybe not. The green arrow points to the zoom stem, coming out of the field toward you. The red arrow is pointing to a heavy duty brass post covered with a white bumper, which I will call the Golden Post (because normal lens terms like helicoid and cams don’t work here). The brass base of the golden post slides up and down (in the picture’s orientation, it would be side-to-side on the lens) the two aluminum rods. And the rods are connected to the large aluminum base plate you see below everything else. The Golden Post inserts into the Magic Slot we showed you above. 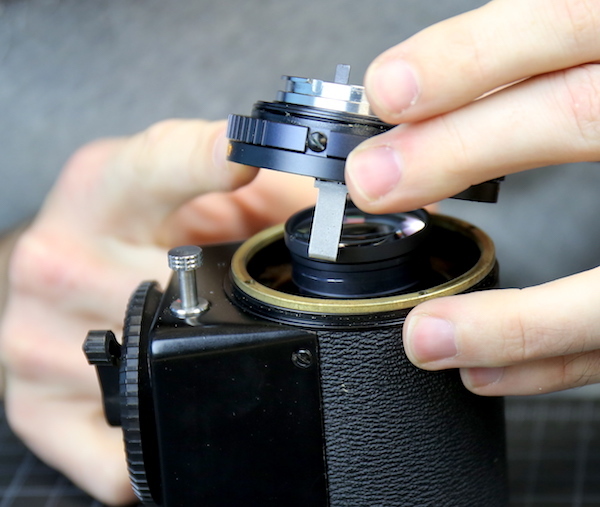 As we just pointed out, the Magic Slot moves forward and backward when you turn the focusing ring. 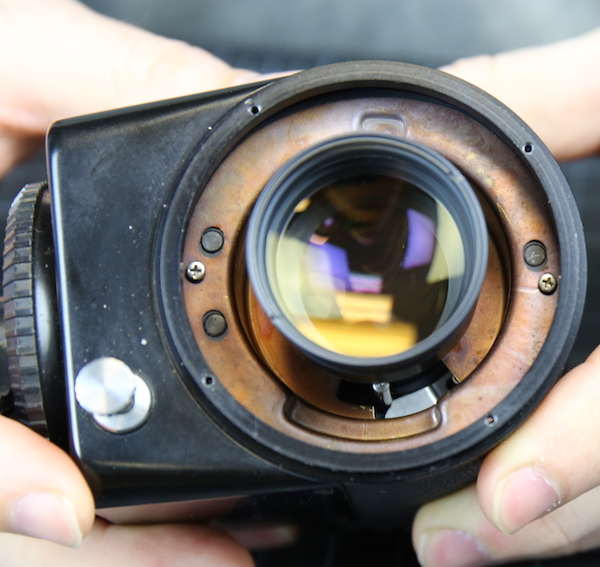 This moves the Magic Post and therefore the aluminum baseplate, which is attached to the lens’ optical system forward and backward too, focusing the lens. 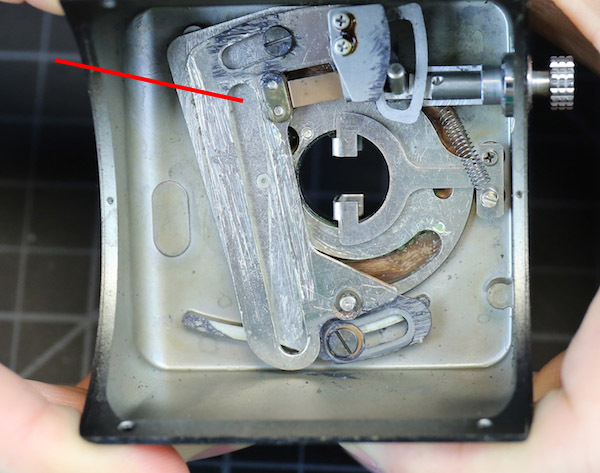 You can see the two cam screws at the close ends of the slot in the pictures above and below. These move the zoom elements when the copper plate rotates. Aaron’s forceps are pointing to one of the cams in the picture below, shown with the lens zoomed about halfway. 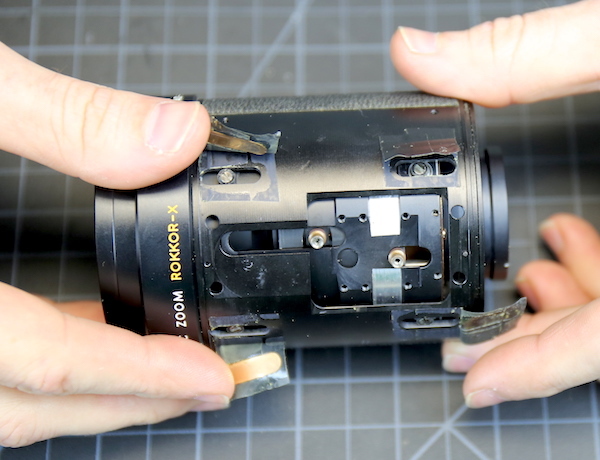 We honestly had assumed there was some type of worm-gear driving the zoom mechanism, but this is very similar to the slots you would see in the rotating barrel of a normal lens. 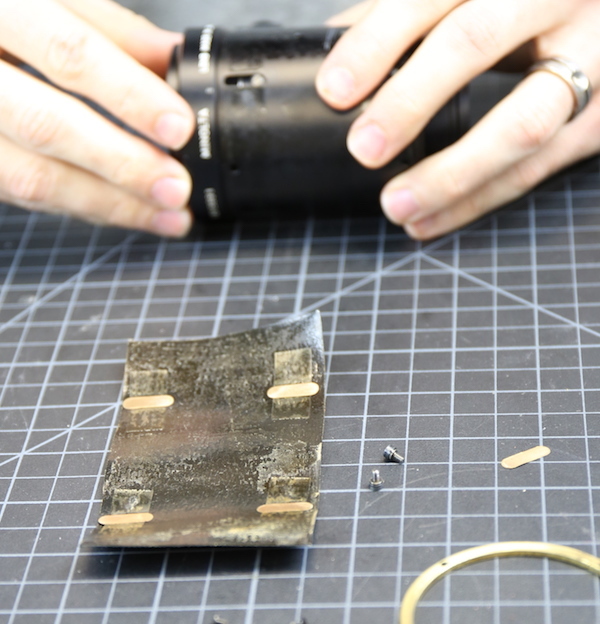 In this position, you can also see a post with a black bumper that is sticking up from the copper zoom plate inserting into the base of the Golden Post. There’s a closeup in the image below. The position of the zoom slides the brass focusing post from one side to the other along the rails. 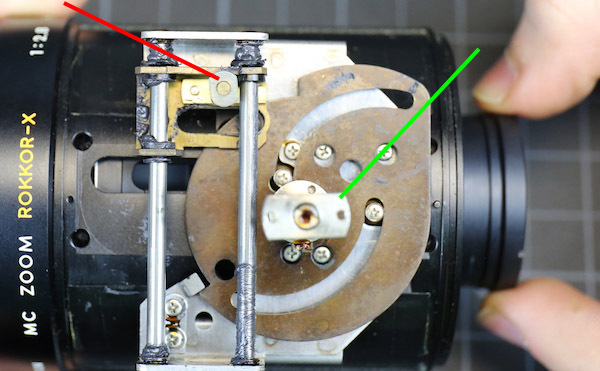 The focusing post is sliding inside of the Magic Slot, the position of which has been adjusted by the focusing ring and the macro thumbscrew. So the post is not only sliding from side-to-side, but it is also moving forward and backward depending upon the position of the magic slot. 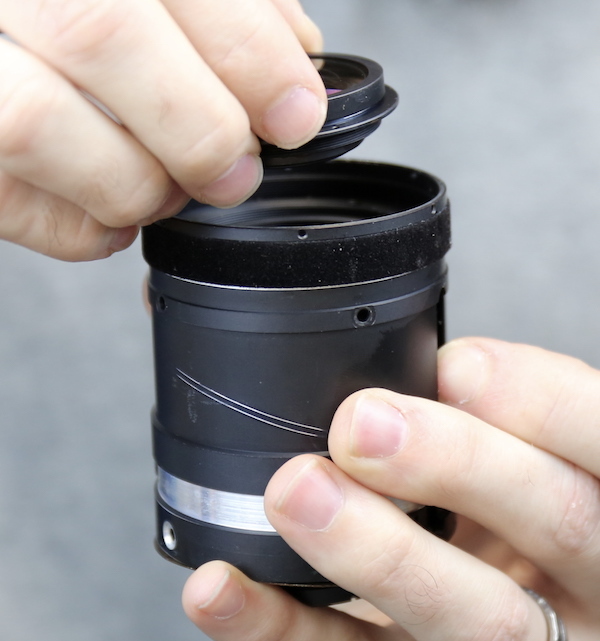 The focusing ring (and the macro thumbscrew) move the Magic Slot towards the front or back of the lens. 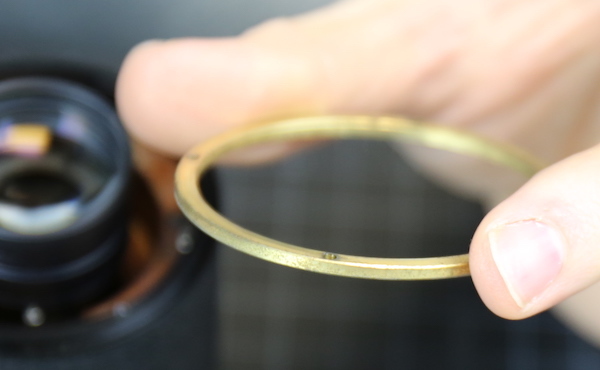 Since the Golden Post is in the Magic slot, the entire lens assembly moves along with it, focusing the lens. 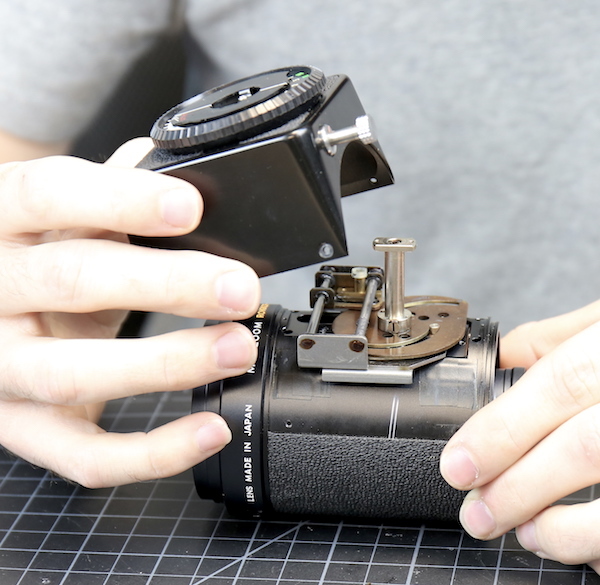 When the zoom plate rotates, it moves the two zoom elements further and closer from each other, zooming the lens. 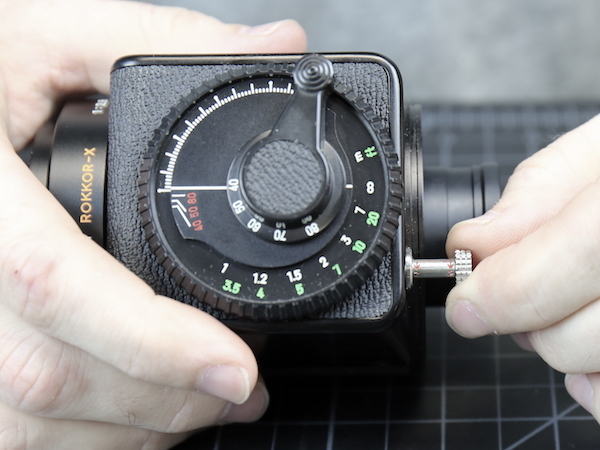 When the zoom plate rotates, it also slides the Golden Post along the Magic Slot, readjusting its focus position. This is an intense little mechanical computer. 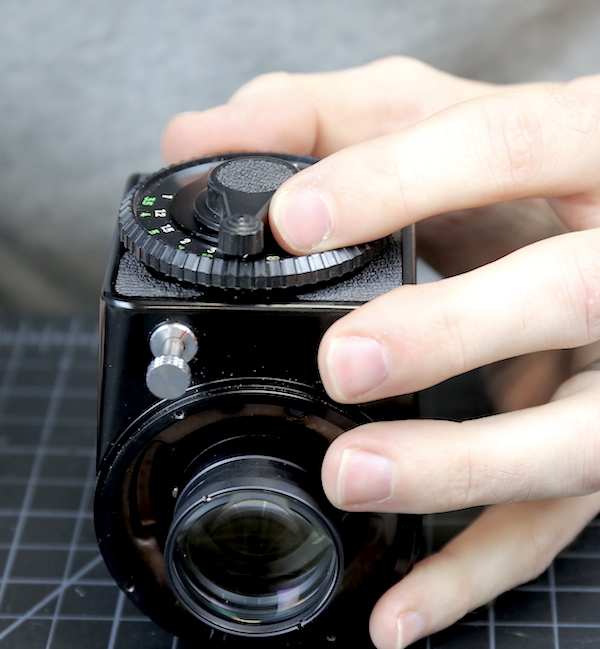 Changing the focal length automatically changes the focus to an appropriate location. 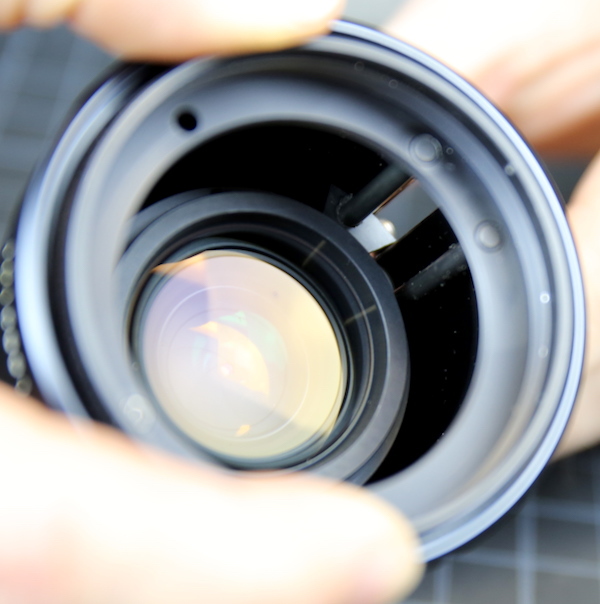 Some modern lenses do something similar, where a series of keys inside the lens move the focusing group when the lens is zoomed. Others do it with electronic programming in the lookup tables. But this is simple and elegant. OK, maybe it’s just elegant. 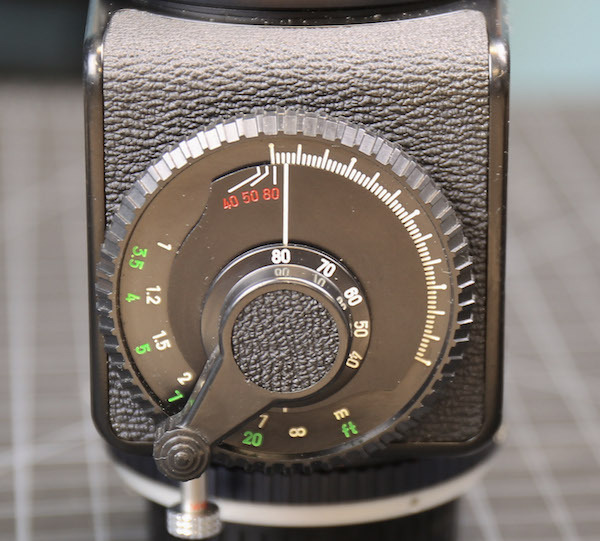 I’m pretty confident a lot of engineers burnt up a lot of slide rules figuring all this out, but once the calculations were made, the mechanics make all the corrections automatically and should keep the lens fairly parfocal when zooming. 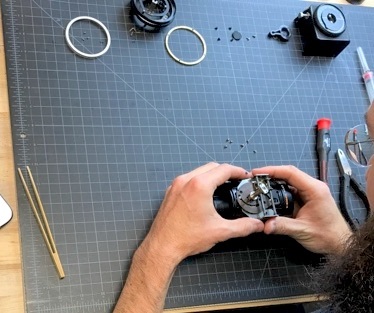 Obviously, I was most interested in how the zoom and focus mechanisms worked in this lens, but as long as we’re here, we might as well take the damned thing apart. I could say we wanted to clean and lubricate it, but you’d all know that’s a bald-faced lie. There were screws not removed and that makes us a bit crazy. 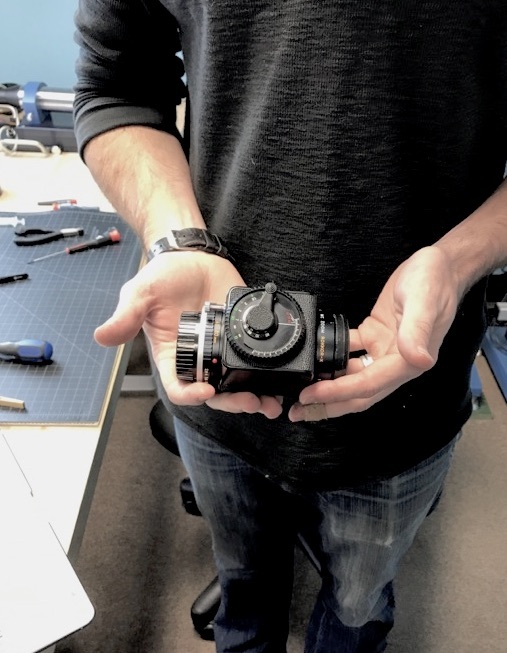 Anyway, by rotating the zoom plate, Aaron could access the screws that hold the mechanical assembly to the lens. With that off, we can see how the zoom groups move. If you scroll back up to one of the pictures of the copper plate, you can see the two cams in their slots in the plate. With the pate removed you can see how each of those elements moves when the plate rotates. Now I could next show you a dozen pictures as we tried to, in order, remove the front ring, remove the copper ring from the back, remove the zooming cams. 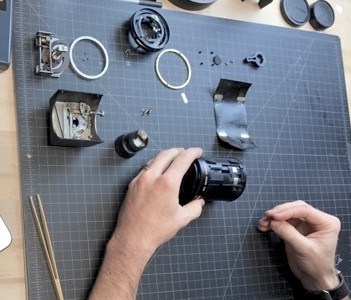 Well, we tried all of those things, but the lens didn’t disassemble. It rattled some but didn’t come apart. So next we went with Aaron’s Second Rule of Disassembly: All leatherette must be removed. This gave us access to nice, thick bolts that held most of the fixed elements in place. We removed these, of course, which wasn’t, perhaps, the best idea. (Actually it was our best idea, on the basis that it was our only idea. It just wasn’t a good idea.) When the first bolt came out, we heard the rather sickening sound of a nut of some type falling into the lens. This, my friends, was the point of no return. 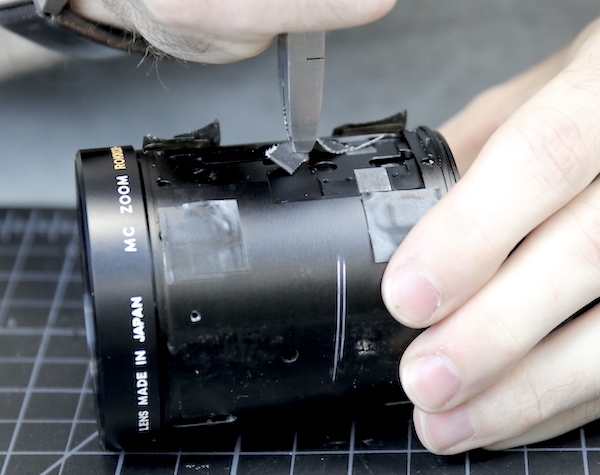 Now we had to get the lens disassembled, even if that meant using a circular saw. Acting like we were cool with all this, because people were walking through the repair space, we took out the rest of the bolts, after which we were able to slide the front group part-way out of the lens. It was nice to see, even at 40 years old, there was a nice felt ring protecting the insides of the lens from the outsides of the world. It would have been nicer to see the optical group just slide right out. But, of course, like everything else about this lens, things weren’t as we expected. 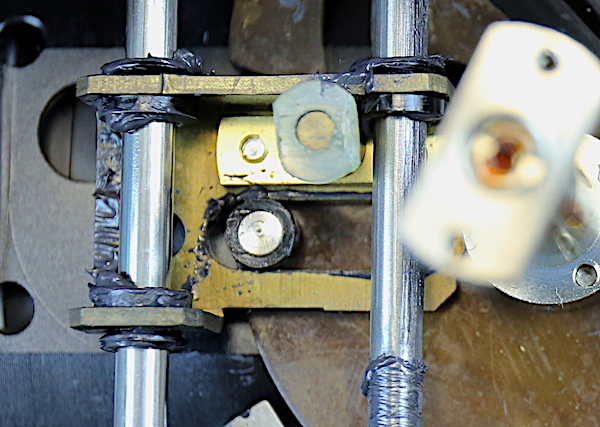 Our last vague hope was that, with the front group partially out of the lens, some more set screws were exposed. And after removing those, we could unscrew the front element from the rest of the front group. And, as you may have noticed in the picture above, this created enough of an opening to let us drop the ‘nuts’ out of the lens. All 8 of them. With the front group removed, we could see the remaining elements slide up and down on three relatively thick rods (you can see the ends in the image below, and the rods themselves in the next picture). But the rods run inside the inner barrel. 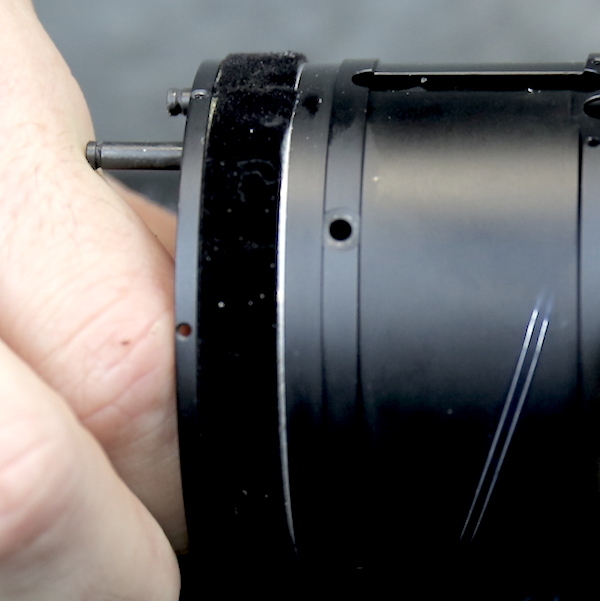 To get the outer barrel off, we still had to remove the focusing cams from their elements. 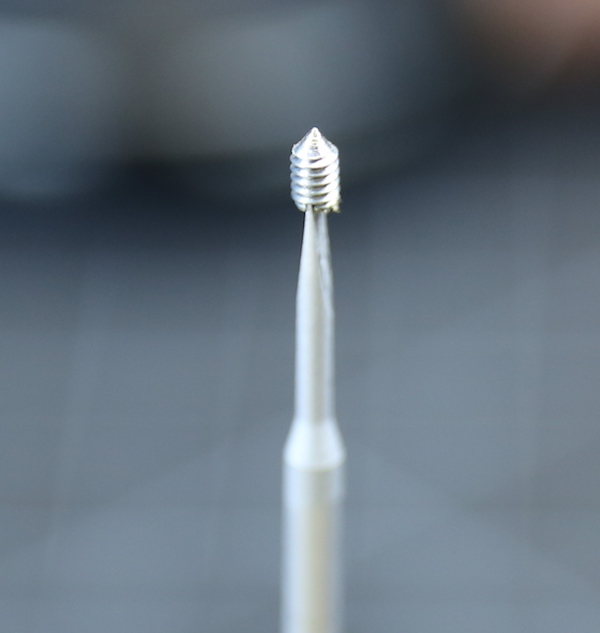 We eventually accomplished this, using multiple applications of glue remover, heat, and torque. Finally, with those removed, we could slide the inner barrel out of the outer casing. These last few pictures represent about an hour of time and a thorough and complete use of our full lexicon of unprintable words. This gave enough access so that Aaron could get a grip on the second element and unscrew it. 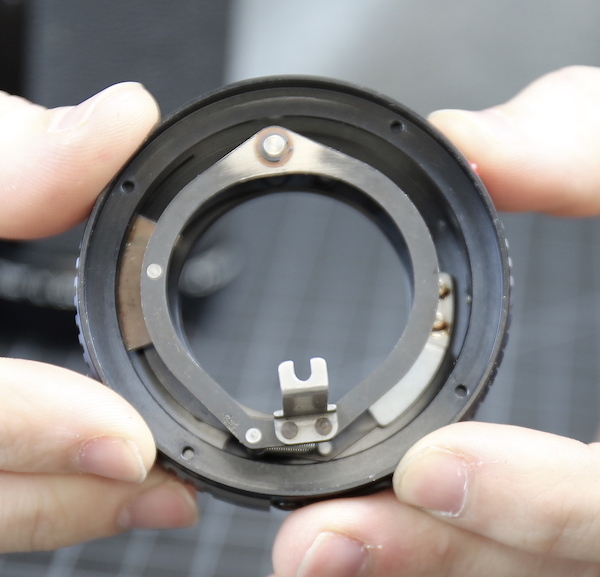 There were several spacing shims underneath that second group, which is the only true optical adjustment we found in this lens. Now, with all of the front optics removed, we have an unobstructed view of the aperture blades. They looked just like aperture blades, and at this point, we were glad to see something that looked familiar. We went to the back of the lens and removed the screws from the copper plate (well, copper looking, I don’t think it’s copper) at the back because those were the only screws left. Of course, it would not come off over the rear element. Pulling it back did expose the rear end of the rods passing through the lens though, so we removed the set screws holding the rods in place. Then finally found more set screws at the front of the optical barrel, under the felt. With all the set screws removed we could push the rods up from the back. And suddenly we were done! With the rods moved up, the rear group slid right out. In retrospect, we could have done this a lot earlier and saved, well, time, sanity, and curse words. There was, of course, one more set screw to remove. 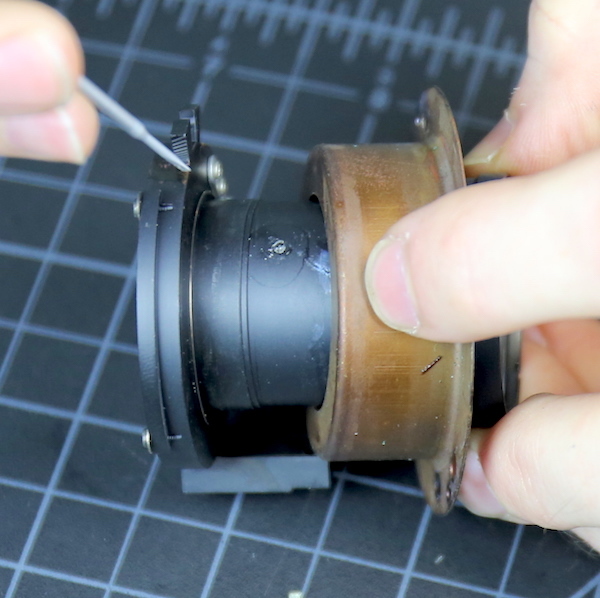 After removing that, the aperture assembly unscrewed from the rear group. And only then could we take the rear group out from the copper plate. That there were some slick engineers working on things at Minolta back in the 1970s, thinking way outside the box. This was an entirely different way of making a zoom. I have no idea why this didn’t catch on. 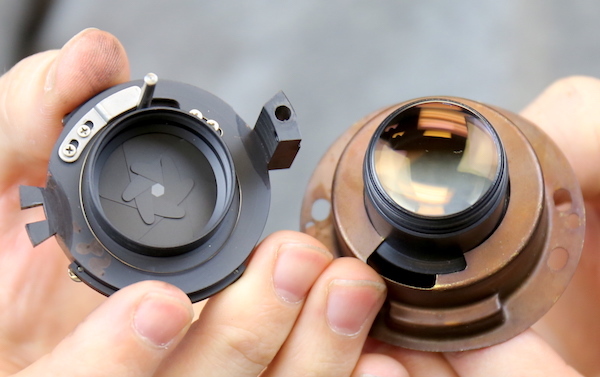 It was smaller and in many ways simpler than competing lenses. It was, perhaps, too different. Or maybe just too difficult to assemble and disassemble (although I’m certain there were easier ways to do it than our fumbling about). It might have been more expensive to make. 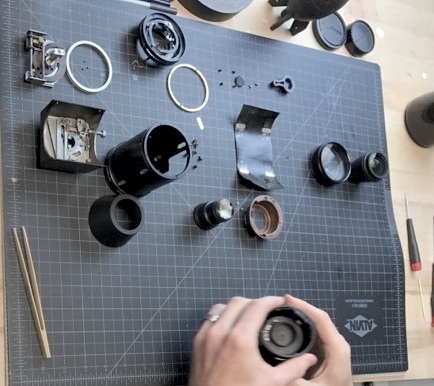 Or maybe it was too costly to keep making one clockwork lens when the others all used routine zooming and focusing methods. But it’s an impressive example of some engineering gone wild, and I always love seeing designs that are outside of the box. I could go on, but my fingers are starting to hurt! Yes, Minolta had some firsts, but in the 1970s and 1980s, Nikon OWNED the professional camera market. There is a reason that Nikon and Canon thrived, and Minolta was forced out of the camera business in 2006. Reading, and rereading, Asimov is one of life’s pleasures. Thank you for the reminder! This was actually one of the longest projects we’ve done. Total of about 10 hours of my time and a similar amount from Aaron. He did the reassembly, I wrote the post. That post would be very welcome, especially if you could also talk a little about molded asphericals and the size limitations manufacturers face for them (I’d love to know what’s the current status). Remember when you were a kid and one friend had all the bad ideas, but the other had the car you needed to get to where the bad ideas were? That’s me and Aaron. I have the bad ideas but I couldn’t do the tear-downs and reassemblies. They’re starting to. The Sony FE 70-200 f/2.8 GM does and I think a couple of others. 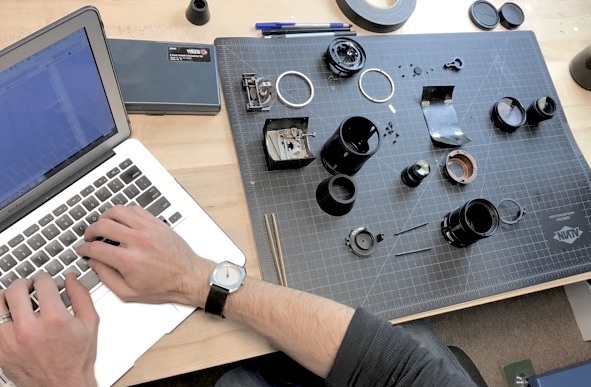 Roger… if there ever was any doubt that you are “King of All Lens Geeks” then this teardown should cement your position. All of us other geeks thank you for your meticulous work. Someone had to do it, and you and Aaron are clearly more qualified for the task than any of us are. This is why you will always be the King and always command our respect and appreciation! I really love the way designers and engineers can go “all out” to create something technically beautiful (when you let them) but impractical and difficult to repair. Someday, this sort of engineering will be a lost art. But at least in the meantime we still have Lensrentals to do this important work for us. I used to shoot Minolta cameras and lenses. I had the Minolta XK (non-motorized), and the Minolta XE-7, which Leica based one of their cameras on. Both were sturdy, metered well and were very reliable. Then came autofocus and obsoleted all my Minolta lenses. I switched to Nikon as they used a mount that would accept both autofocus and manual focus lenses. Still, those Minolta XK and XE-7 cameras were impressive gear. We’re about halfway through clean, lube, and reassembly. 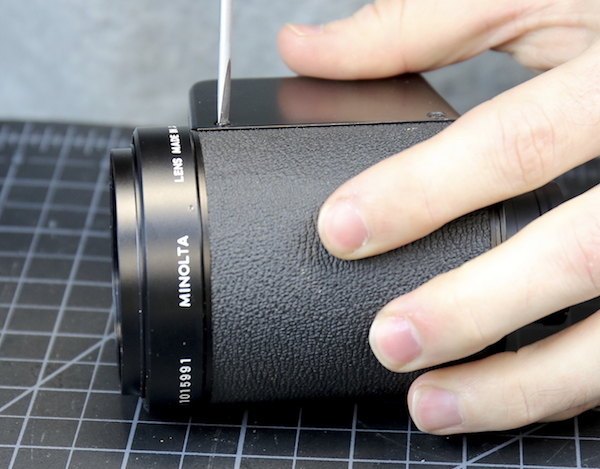 Remember, leatherette is made to peel off, just like camera grips today, during any repair. The age may make it a little brittle, but we have new leatherette we can replace it with if necessary. I’m puzzled by the fact that fly-by-wire lenses don’t do all these adjustments automatically. It should be very simple. And linear EM focusing should allow for more groups to move independently of each other. I guess it takes time to change designs to allow these options, so we’ll see more and more of this in the coming years. 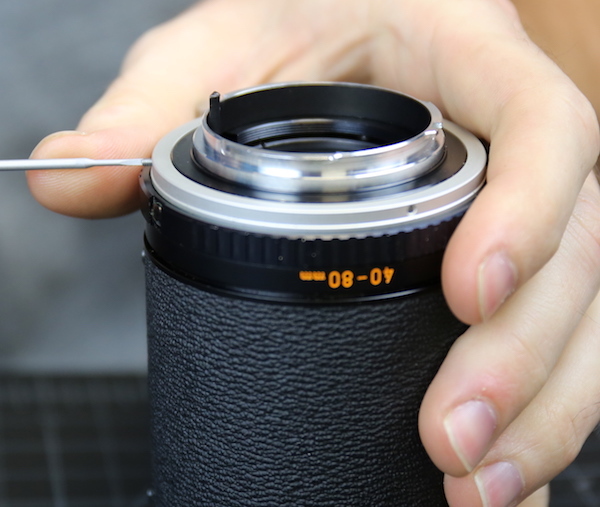 Minolta Lens Engineers have been genius, that long time ago. So far, the lens was being introduced into my birthday year, so it must be great. :~) Thumbs up, Roger & Crew, for showing us these internals. 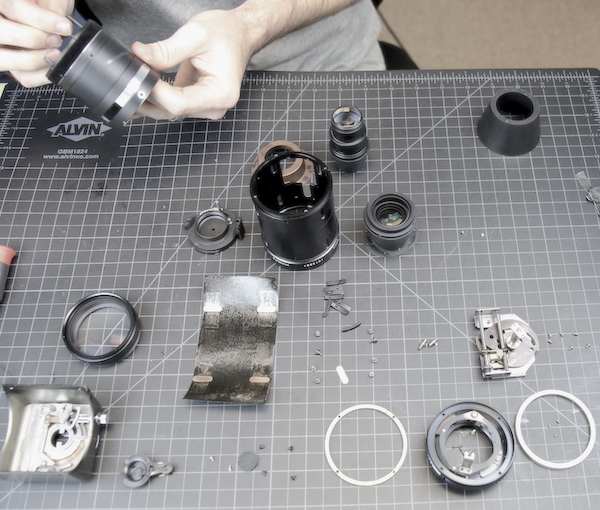 As a sidenote, do you guys really got this lens reassembled & working again? I mean, the nice faux leatherette…huh. It’s mechanically a complex design, way complex for it’s heyday. “Minolta, in the 1970s and 80s, was arguably the most innovative camera company…” I have to agree. I still have a Maxxum 7000, my first AF camera. (One value estimate I got for the entire kit was $45 – 3 lenses, remote release, external battery pack, etc.) Sigh. The AF speed was godawful by today’s standards, and it often hunted with the long zoom (a 100-300mm) and in low light, but I used it up to the 2000s, when I finally purchased a DSLR. 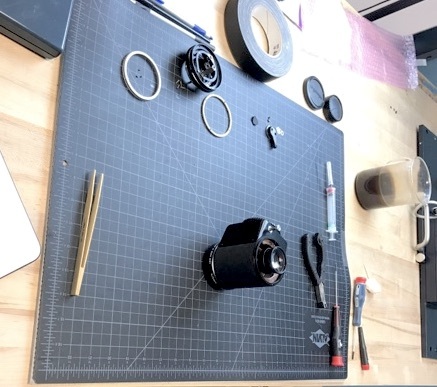 30% make it into a cell phone, not the trash 🙂 Yield doesn’t matter when it takes about a minute and 20 seconds to make a mold with 30 lenses on it and the material is relatively cheap plastic. 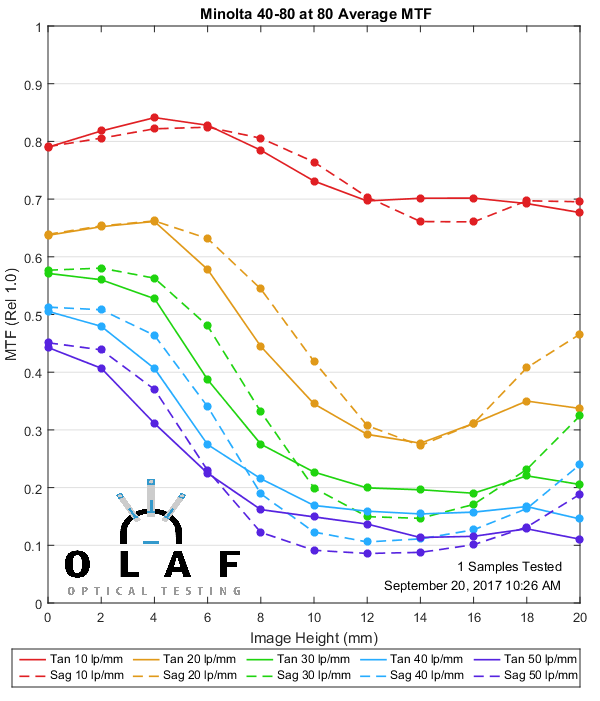 As a US lens designer, I have limited visibility into the plastics used by the chinese molded optical manufactures, but if you want to google around the plastics I know by name are E48R, K26R, SP1516, EP5000, PMMA-O, Polystyrene-O, Polystrene-O, ZF52R, and OKP4. I’m sure there is e.g. EP6000 or EP7000, and they are just not materials I have access to. If you want some real amazement, Fuji is usually credited with introducing computers to optical design/optimization around 1973 or so. In the US, Hopkins had some papers on it in the 1950s or so, but from a research perspective using a supercomputer at cornell for some exorbitant fee paid by the institute of optics. His conclusion was basically that the computer would replace the rooms of young women lens designers were using as calculators, but never replace the thought of the designer in optimization. These days you basically hold the optimizer’s hand and push it around the solution space, how very wrong he was. In the mid 1960s, Kodak actually had built a mainframe computer based on 4 Friden electro-mechanical calculators that could trace about 1000 rays an hour. This machine appears in no publications and is otherwise secret, except for its appearance in a promotional video Kodak released at the time that John Grievenkamp showed in his talk “Optics Goes To The Movies” at IODC 2017. No one knew what the machine did, since it is not mentioned in the film, but Robert Shannon worked at Kodak at the times and remembers it as a raytrace computer. The Friden machines were several thousand dollars, and allegedly had a lifespan in this machine of about 4 months before the solenoids that pushed their buttons and read the results wore them out. Thank you, Amit. I included that one in the references, but it’s worth repeating. Thanks for the teardown! 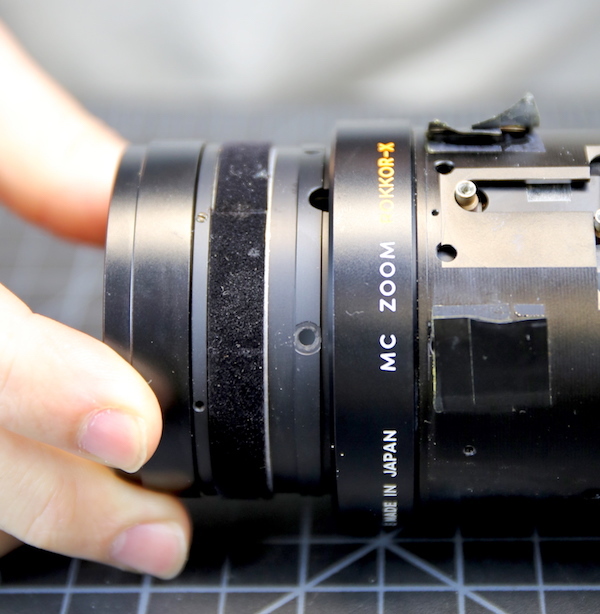 This is a fascinating lens (The only one I ever saw had a broken front element). This article (https://outfor30.com/2017/08/13/a-forgotten-solution/) talks about the motivation behind the unusual design. You are certainly correct, Chris. Which makes me sad. . . . I loved the mental picture of slipsticks and pocket protectors, heaping ashtrays on the tables. . . . Fascinating article, Roger. Thank you. However, a nit picking correction might be in order. The HP-35 pocket scientific calculator appeared in 1972 and the whole engineering community (myself included, as a engineering student then) switched to it from slide rule nearly instantly notwithstanding the substantial purchase cost. It was like changing from a stone axe to a chain saw. And from 1968 the desktop hp 9100A scientific calculator was also available although its use was not widespread, as the price was prohibitive – equivalent to about $35,000 today. 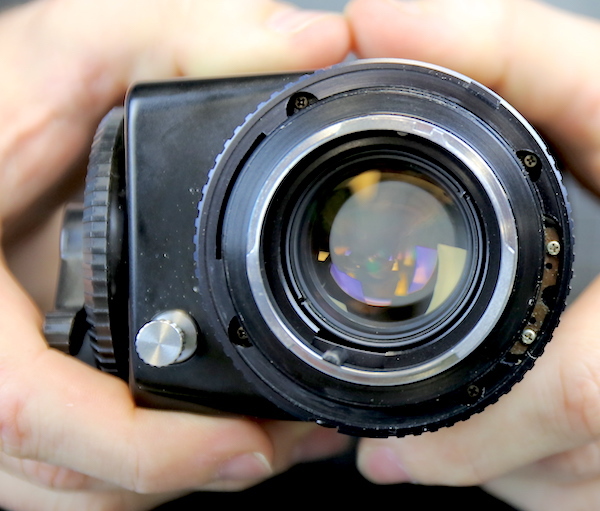 So, perhaps the Minolta engineers did not have to use slide use when designing the lens. I bet Brandon will be around shortly to give a better answer. 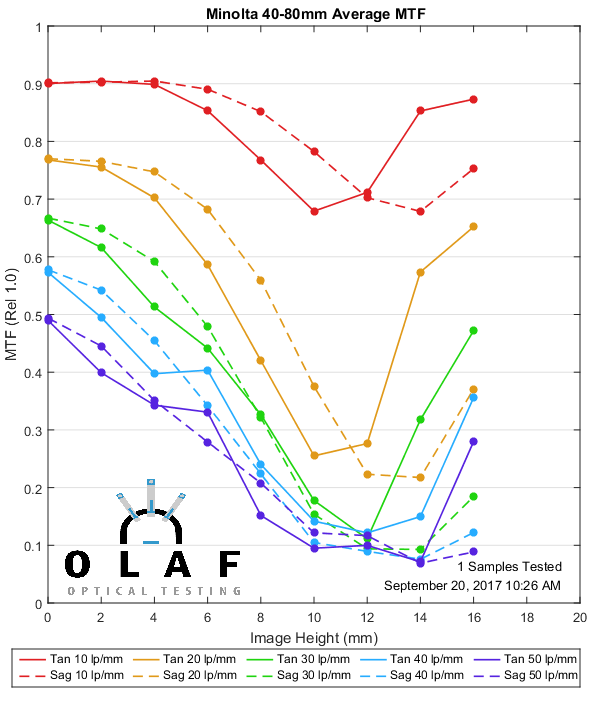 But the two things I know are small image sensor helps a lot, and the automation makes them so cheap that they test them at the end of the assembly line and don’t mind if 30% or so go in the trash bin. Plus the small size makes that testing very easy and automated. I LOVE your history articles! Just brilliant stuff you can’t really get elsewhere on the internet. Thank You! Request: I know it’s not in the lensrentals business line, but I’m sure many of us are curious about the optics of good phone cams. How can they possibly resolve so well with such apparently excellent contrast and light gathering when they’re so tiny, have so few elements and more often than not are made of plastic! (What kind of plastic? Eyeglass type plastic?). Why isn’t diffraction an major limiter? etc. I think the inclusion of a video or even a GIF of the Magic Slot in action would be very helpful. This has been my favorite teardown so far! 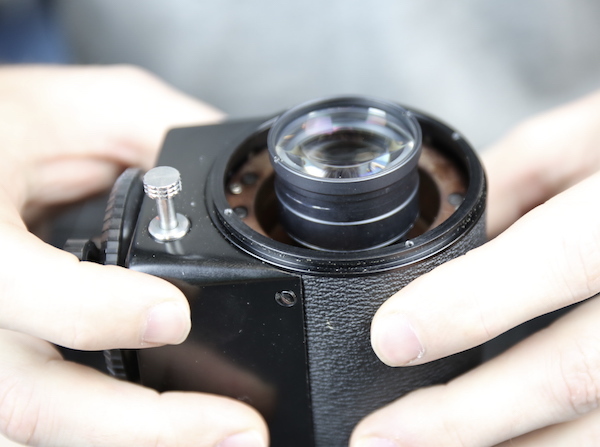 I had one of these lenses “back in the day” — it was about the only wideish-to-portraitish f/2.8 zoom that wasn’t crap — and I was always curious what was inside that box. Little did I know it contained a Magic Slot! Usually I say read the post in reverse. In this case, since we disassembled it in ways it was not meant to be disassembled, that doesn’t work. 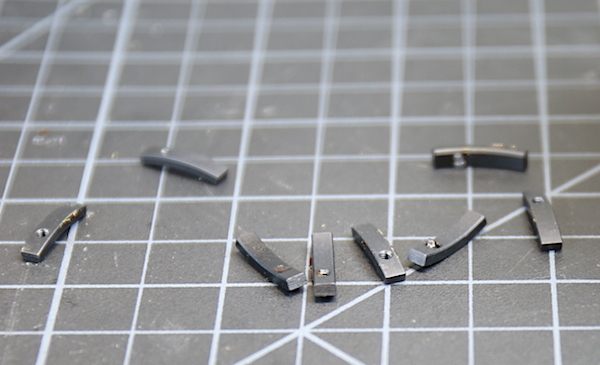 Assembly order involves putting the reassembled optical assembly back down over the rods. Truth is it isn’t done yet because the disassembly took waaayyyyy longer than expected and we ran out of time. We need to clean all the glass up, clean and lube all the mechanicals, etc. It will take a full day to reassemble and we won’t have a free day for another week. Wow. Next can you show us how you put it together again?